There's a whole bunch of different battles being fought across the greater New York area, and I was trying to figure out which ones were worth focusing on. To help with that, I created this map of traffic fatalities per capita in the various counties of the metropolitan area. I got the data from the Fatality Analysis Reporting System of the National Highway Traffic Safety Administration. You can get the data sliced and diced in various ways; I chose fatalities from 2005 by county. To get per capita fatalities I divided it by the population estimates of the 2005 American Community Survey, available from the Census Bureau. 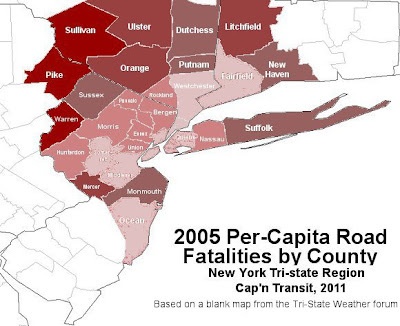 I used a blank county map from the Tri-State Weather forum that turned up on Google Image Search, and colored the highest fatalities per capita: the darkest are over 4 fatalities per ten thousand inhabitants and the lightest less than 1.5 fatalities. There seems to be some kind of Upper Delaware Valley of Death going on, with 6.49 fatalities per ten thousand inhabitants in Sullivan County, NY, 4.11 in Pike County, PA and 4.04 in Warren County, NJ. It's not just because people drive more there: in 2005 there were about 10,000 vehicle-miles traveled per capita in Sullivan and Pike (roughly in line with Middlesex, Bergen and Dutchess Counties), and 12,000 per capita in Warren (slightly less than Ulster and slightly more than Orange). But there were 6.25 fatalities per hundred VMT in Sullivan County, 4.11 in Pike and 3.28 in Warren. It may be that the fatalities are due to the large highways that cross these counties: Sullivan hosts NY Route 17, while Pike has Interstate 84 and US 206 and 209, and Warren has Interstates 78 and 80. It may be other factors: Sullivan was also highlighted by Slate Labs as the worst "food desert" in the entire Northeast, the county with the highest percentage of people (8.05%) living more than a mile from the nearest supermarket without a car. DWI is also a potential factor: if you can't get to a supermarket without a car, you probably can't get to a bar either. Counties with between three and four fatalities per ten thousand inhabitants were Ulster, Orange, Mercer and Litchfield; those with two to three fatalities per ten thousand included Sussex, Suffolk, Monmouth, Putnam and New Haven. 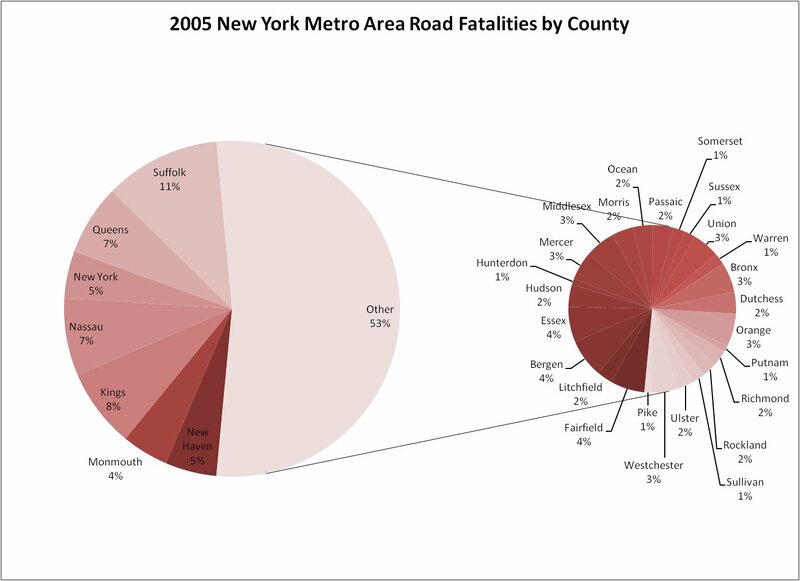 The five boroughs of New York City plus Westchester all had less than 2.2 fatalities per ten thousand inhabitants in 2005. The Bronx had the lowest per capita fatalities, with only 109 deaths for its 1.4 million people. The biggest contributor, with its 402 fatalities in a population of 1.5 million, is Suffolk County, with eleven percent of the total. Brooklyn, Queens and Nassau were the next biggest contributors, then New Haven, Manhattan and Monmouth County. All the others had less than four percent of the total. 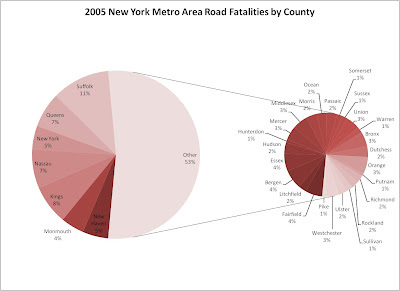 This means that the island of Long Island (including Brooklyn and Queens) accounted for a full third of the region's traffic deaths in 2005, and any island-wide improvements that can be made would bring down carnage significantly. Obviously, I'm not distinguishing deaths of pedestrians, drivers, cyclists or car passengers here, let alone people killed by cars in buildings and parks. Pedestrian killings discourage people from walking, so they're more significant, but for the purpose of this exercise I wanted to look at the overall human impact of car culture. I can't help but notice that Sullivan County is part of the "Borscht Belt" vacation area, with large numbers of seasonal urban drivers and vulnerable carless populations like grandmothers with small children. I have no idea what the size of this vacationing population is, but it may be worth looking at the seasonality of the crashes involving pedestrians. We have a weekend house up in Sullivan County. The horrible drivers from the bungalo colonies are an ongoing nuisance throughout the area. Recent upgrades to Rt 17 should help to provide some reduction in fatalities, but drivers zooming through red lights in towns and speeding along country roads will continue to be a problem. A new concern is the impact of a casino and the additional traffic it will bring.